Boo, was a day or so old when his mum had abandoned him, he was rescued by the Sanctuary´s local vet at Dunollie castle in Oban on 15th June 2014. Click here to read about Boo´s rescue. 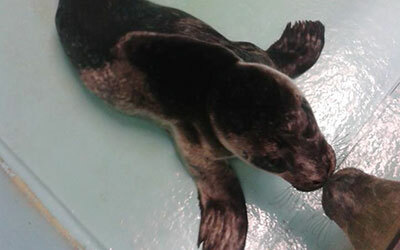 Boo is the only boy in the small colony of seals that he lives with, but he doesn´t mind! Boo loves playing with hoops and his favourite thing is spinning around in the water! He is very playful and Lora, Macey and Pippa are his best friends. Boo enjoys hanging out in the top pool because he is very nosey and curious, so he likes watching all the guests through the windows! 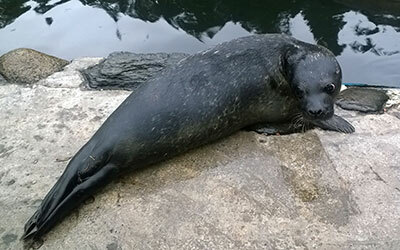 The Scottish Sea Life Sanctuary was closed on 31st October 2018 and Boo was moved to Scarborough SEA LIFE Sanctuary.